There’s a ton of reasons I love going home to Hawai’i and one of them is definitely the food. I’m a total fat kid at heart and there’s nothing like some ono grinds (delicious food)! Luckily I have awesome friends who are (literally) always down to eat and take me to all the hot spots back home. 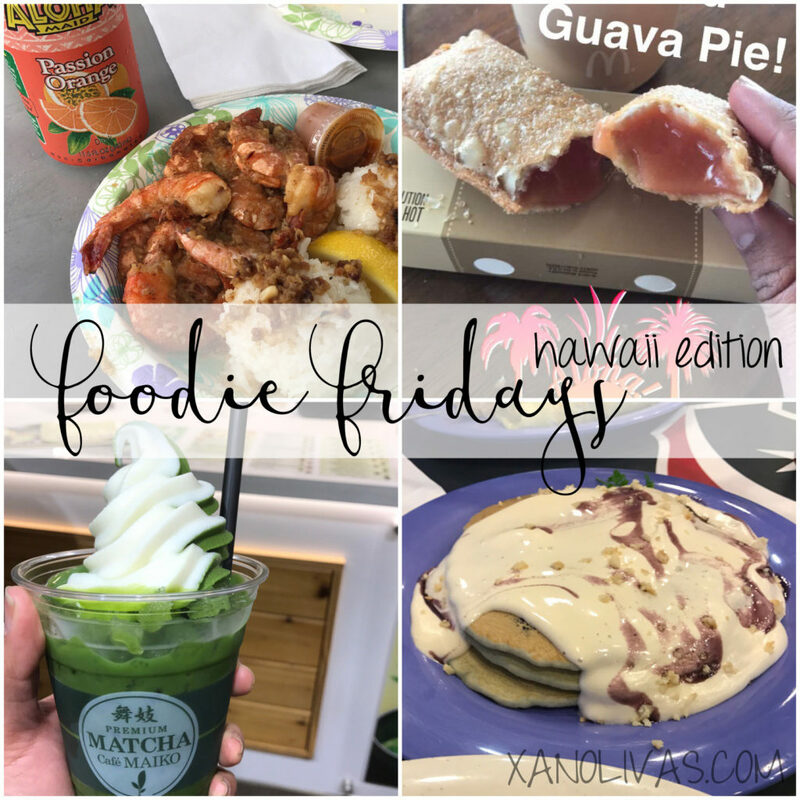 My mainland friends always ask me where I ate so I thought I’d chronicle my recent Hawaiian foodventures. I flew back to Hawai’i with my parents from Phoenix and I was starving when we landed. Normally the flight from Phoenix to Honolulu is 5.5 – 6 hours but for some reason my flight on American Airlines was 7+ hours and they don’t even feed you! My first meal was a Soon’s Special from Soon’s Kal-Bi Drive In in Salt Lake. The special is a plate lunch with meat jhun, kal-bi, BBQ chicken, with a side of kimchi. I grew up eating their BBQ sandwiches and plate lunch after school and I love, love, love their meat jhun. Another spot that I hit up regularly is Shokudo‘s Happy Hour. Shokudo is a Japanese restaurant in Ala Moana. You know you’re a fat kid when you go to a happy hour for the food and not the drinks! 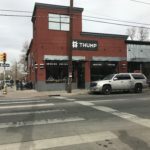 Their happy hour is everyday from 4- 6 PM and Sunday – Thursday, 10 PM – 12 AM. Some of my favorites are the spicy tuna nachos (ask for extra sauce on the side), dynamite fries, garlic clams, and of course the jr. honey toast. 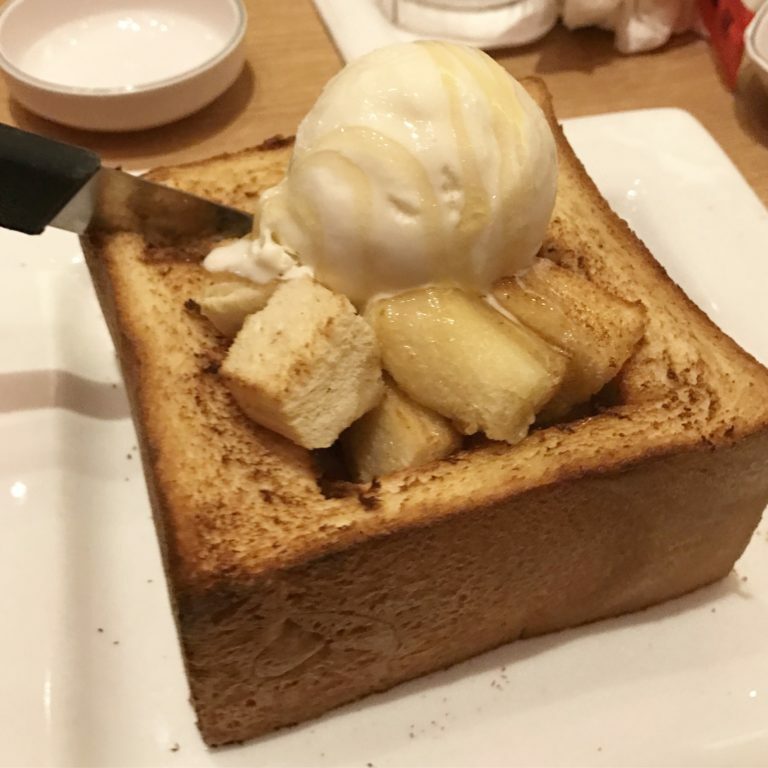 The honey toast is a brick toast with the middle chopped up into cubes topped with ice cream honey. The happy hour menu has a ‘junior’ size which is half the size of a full honey toast. You can even get other flavors, but I stick to the original. Another must have for me is the Kahuku shrimp plates! There’s three popular shrimp trucks on O’ahu: Giovanni’s, Kahuku Shrimp, and Romy’s. 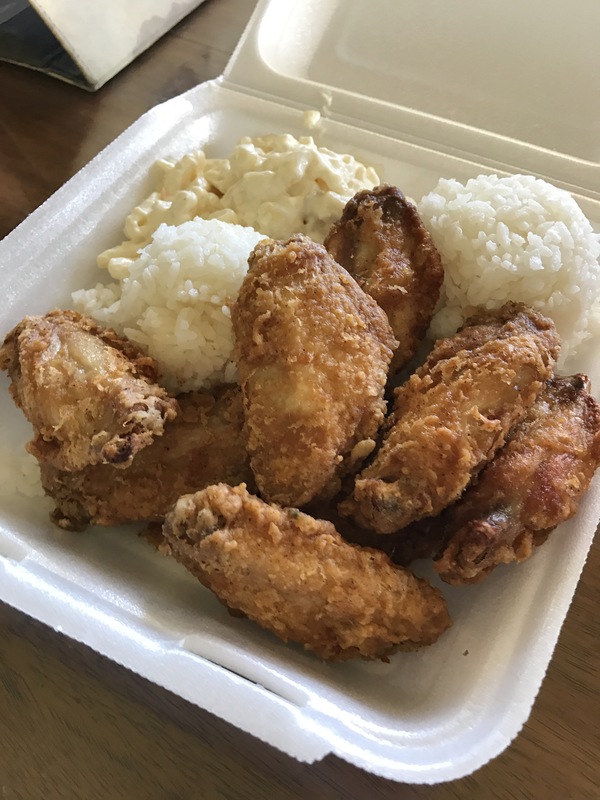 My personal favorite is the spicy shrimp plate from Kahuku Shrimp Truck, but for whatever reason, Giovanni’s Shrimp Truck is more popular. Sometimes the lines are ridiculously long! 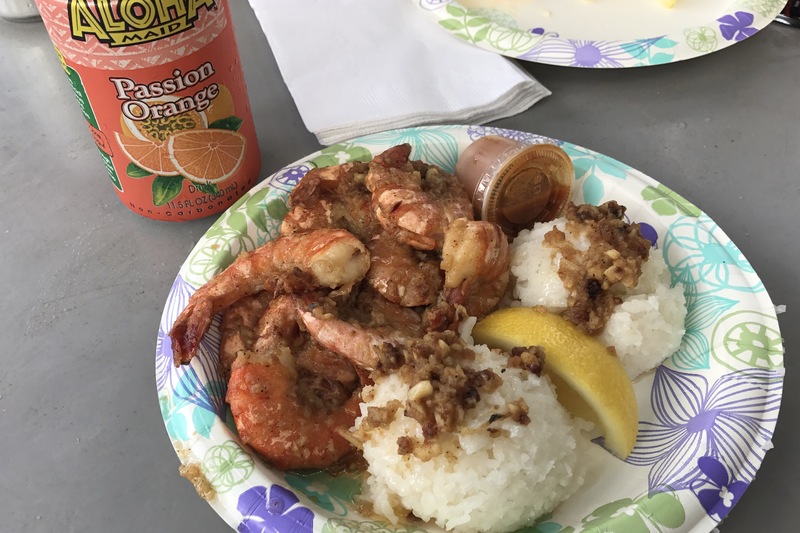 Giovanni’s has two locations, one in Kahuku and one in Haleiwa, whereas Kahuku Shrimp Truck is only in Kahuku. If you like spicy food, Kahuku Shrimp is definitely better, but if you like garlic butter sauce (or scampi sauce), Giovanni’s is good. This trip we couldn’t make it all the way to Kahuku so I had to settle for scampi shrimp from Giovanni’s in Haleiwa. I got the hot sauce on the side but it really just taste like tabasco. Anytime we’re on that side of the island, I always ask if we can make a stop at Pa’ala Kai Bakery in Waialua to get Snow Puffies! Waialua is a far drive from town but the snow puffy is so worth it. 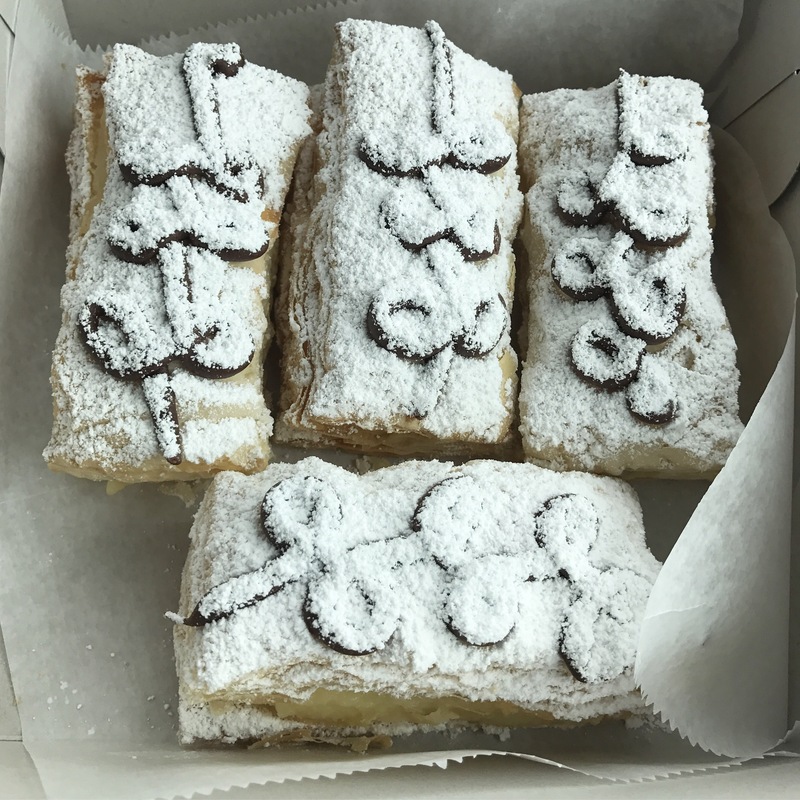 A snow puffy is a flaky pastry filled with custard drizzled with chocolate and topped off with powdered sugar. Omg I’m drooling thinking about it. 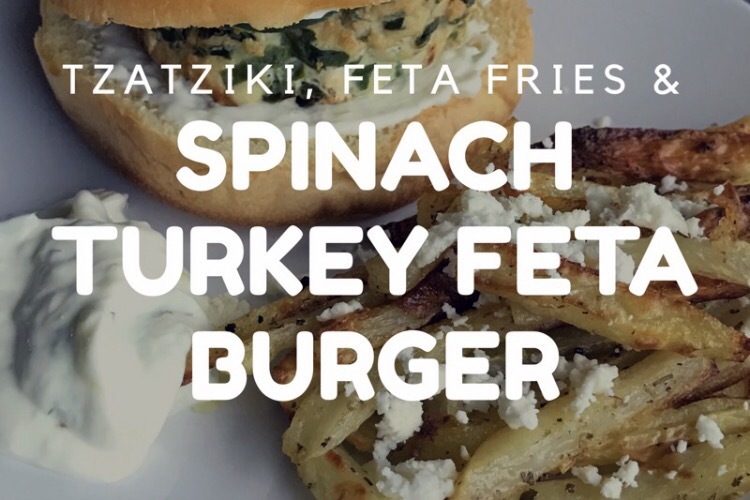 They’re best eaten fresh when the phyllo dough crunches when you take a bite! I think every time I make a trip home my friends take me to a new restaurant to try. 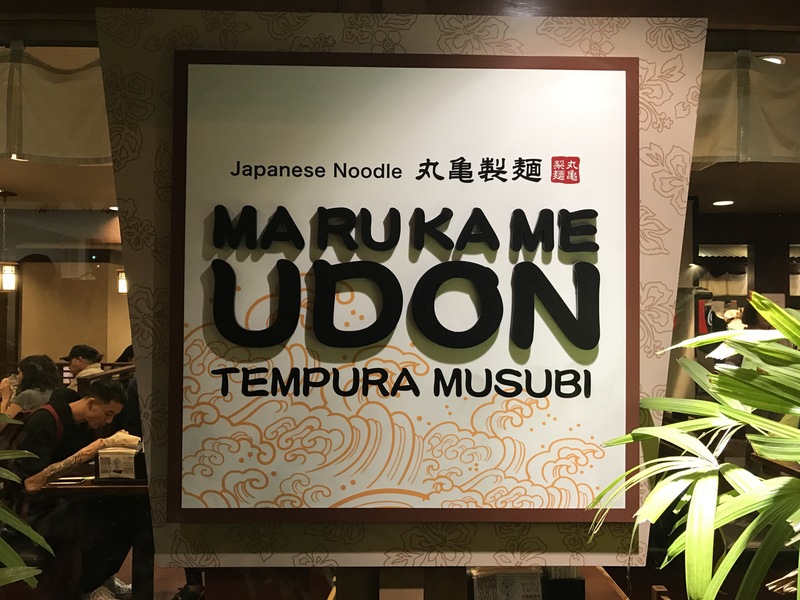 This time they introduced me to Marukame Udon, a Japanese noodle restaurant in Waikiki. 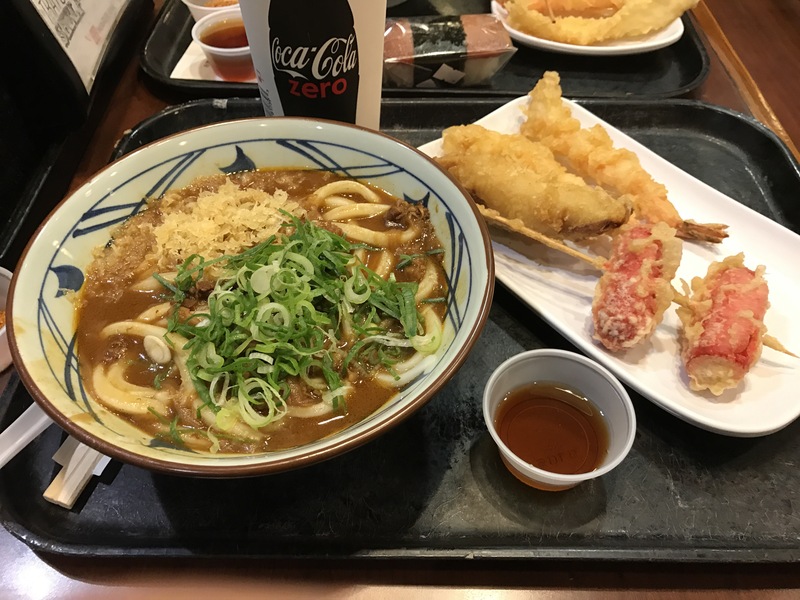 The udon noodles are freshly made and the restaurant style is definitely Japanese. It’s not meant to be a sit down and hang out for a while restaurant, but a get your food, hurry up eat and get out kind of restaurant. The dining area is relatively small and the line seems to always be out the door and never ending but the wait isn’t long at all and the food is delicious. I got the curry udon with sides of fried chicken, tempura, and Hawaiian sausage. Hawaiian sausage is really Redondo’s hot dog, but only locals would know that. Definitely one of the best bowls of udon I’ve ever had. 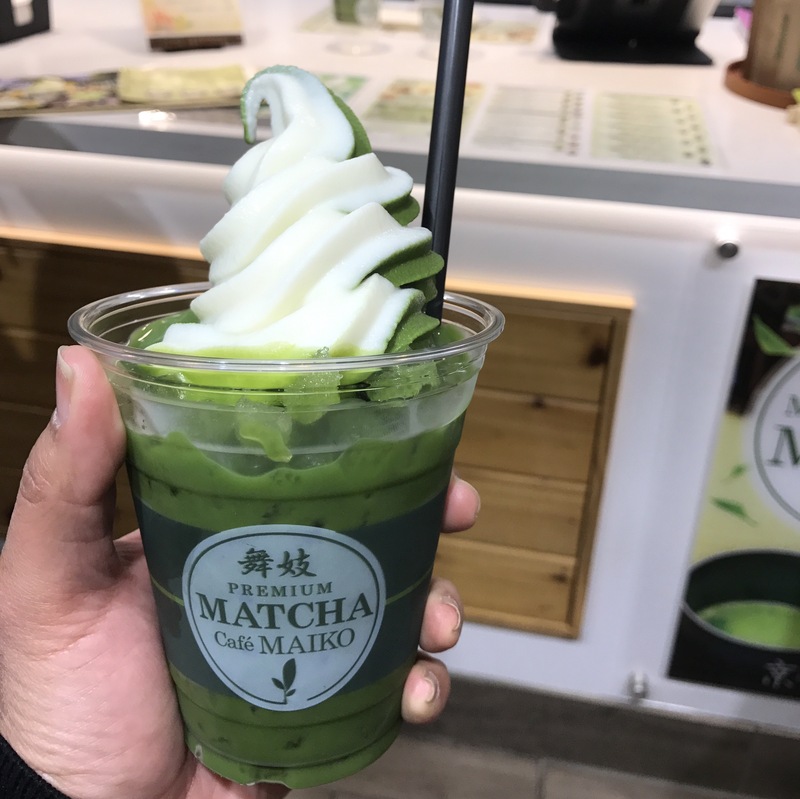 After Marukame, we walked next door to Matcha Cafe Maiko, a dessert place where you can get green tea ice cream or lattes. I got a matcha green tea latte topped with mixed froyo (vanilla and green tea). If you’re not a fan of green tea, I don’t recommend it, but I definitely recommend the mixed vanilla/green tea froyo over straight green tea. 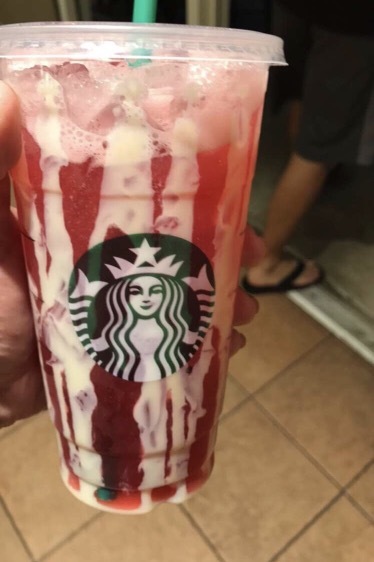 They’re a little bit expensive but you are in Waikiki and to be fair, a Starbucks latte probably cost just as much and you don’t get ice cream! 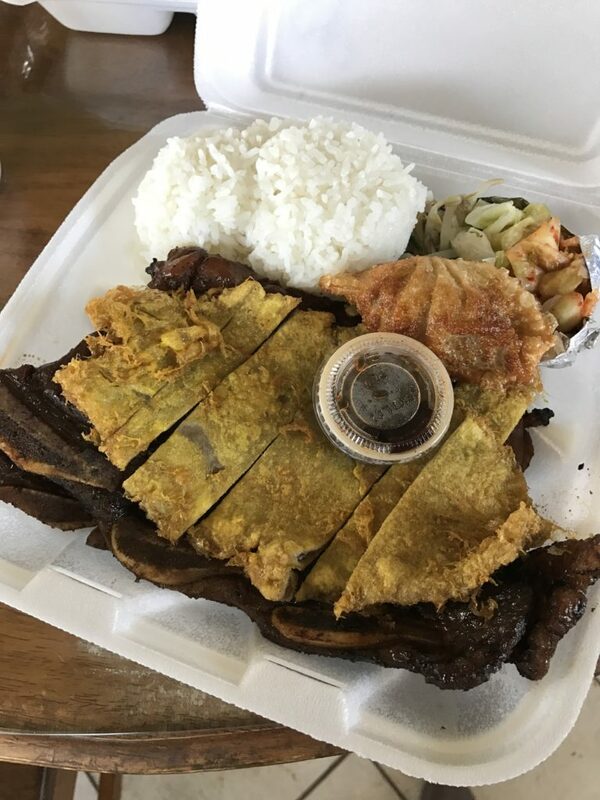 Another spot I absolutely MUST hit up when I go home is Boot’s & Kimo’s Homestyle Kitchen in Kailua. MACADAMIA NUT PANCAKES FTW. Seriously. 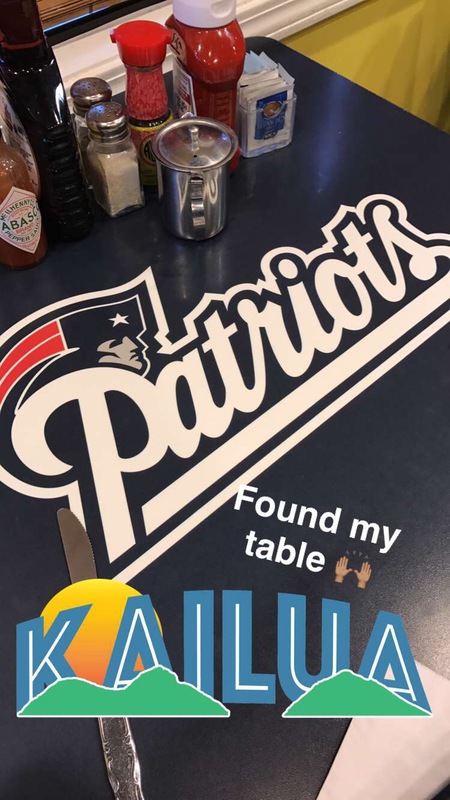 If you didn’t order pancakes when you ate there, I don’t know why you went. It made me sad sometimes because it’s such a popular tourist attraction that sometimes the tourist buses would bring loads of people and make the waits ridiculously long! But the pancakes are like little fluffy clouds topped with this light airy macadmia nut sauce. So good. I really wish I knew what they put in that sauce, though! We usually end up getting an order of pancakes to share and then our own plate of something. 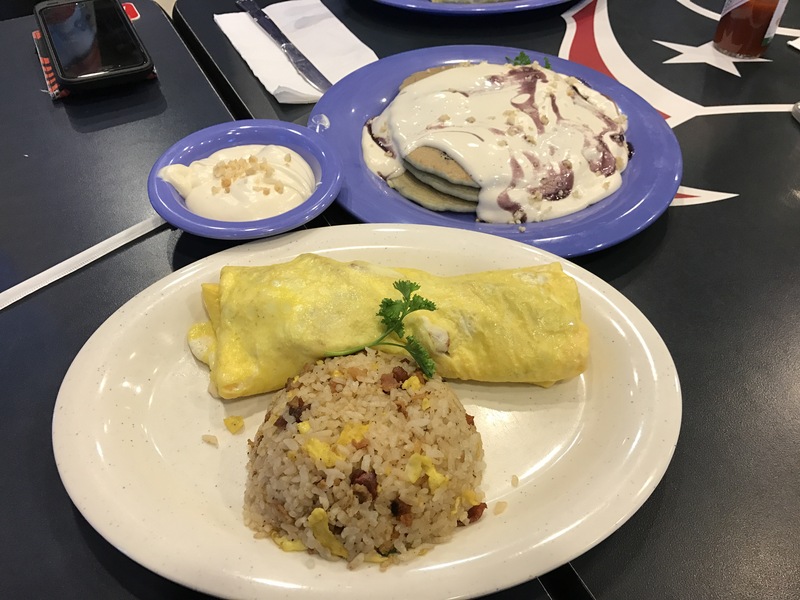 I always order the Portuguese Sausage Omelette and this time we got the Blueberry Macadmia Nut Panckes. DROOL. Oh, and FYI it’s cash only, but if you forget there’s an ATM inside. Another one of my traditions is going to Genki Sushi with my mom. It’s usually the first place I ask her to take me as soon as I land but we were tired from the trip and wanted something quicker. Genki Sushi is a chain sushi restaurant that has a conveyor belt to deliver your food. We went to the location in Ala Moana which has this fancy upgraded conveyor belt where you can order sushi off an iPad and a little boat gets sent straight to your table. 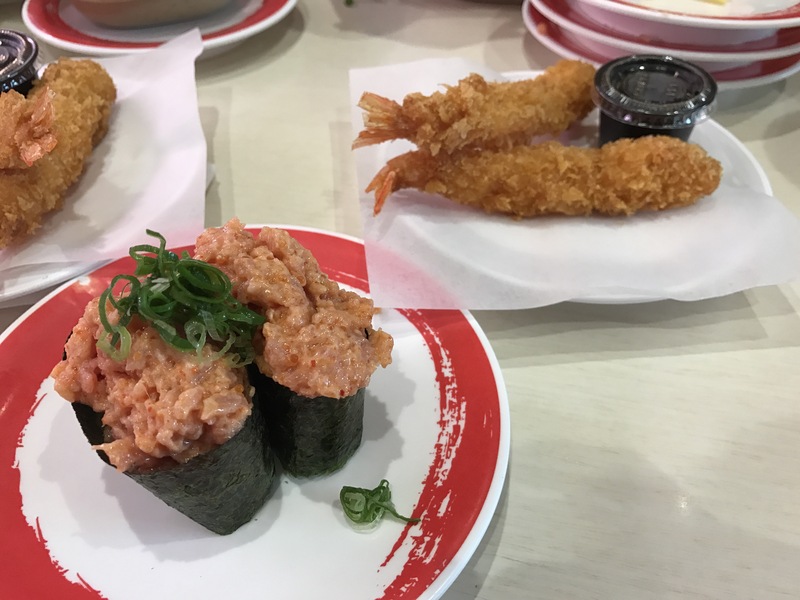 I literally only eat two things from there – the spicy tuna and ebi fry. My favorite food of all time is fried chicken wings and in high school my favorite wings (besides my homemade ones) were from Stadium Giant Malts & BBQ. Growing up they used to be called ‘Bob’s BBQ’ and I still have their number in my phone as Bob’s. It’s a little hole in the wall restaurant near Aloha Stadium that’s cash only. 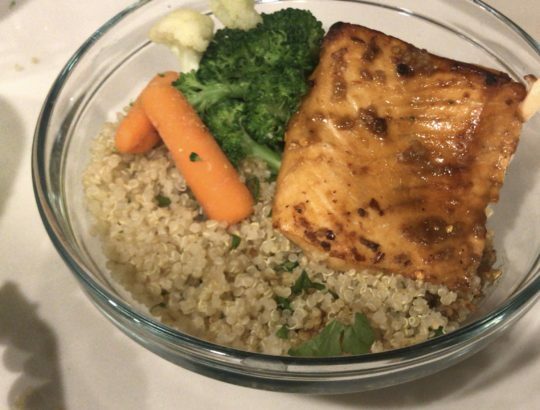 I typically do a phone order, pick up the plate lunch, then eat at home. The same Asian lady that answered the phone when I was in high school still answers the phone today. I love that some things haven’t changed about my little rock. There’s not a lot of Filipino restaurants on the mainland so I love eating Filipino food whenever I can. I had a family lunch with my cousins, a few of her kids, and my mom and we ate at Thelma’s Restaurant in Waipahu. 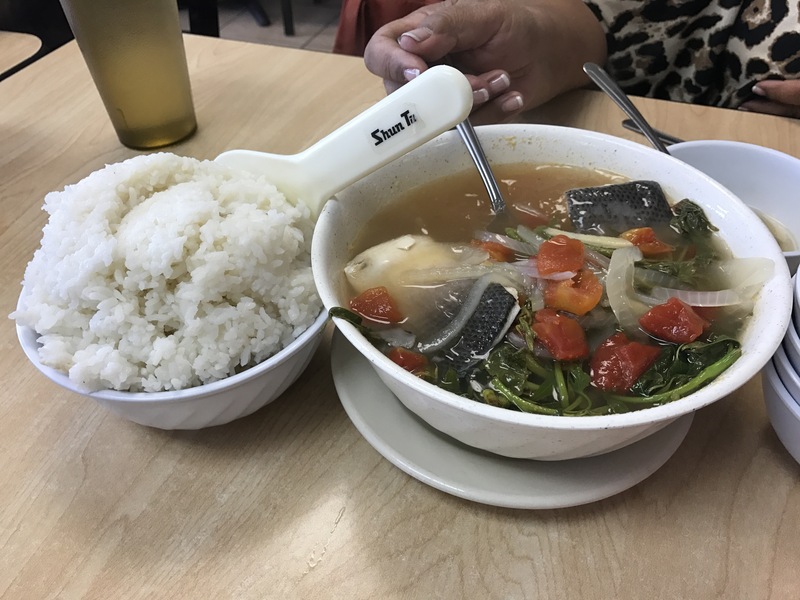 My mom order sinigang, a tamarind fish soup, which is really good but I LOVE the Thelma’s Special. 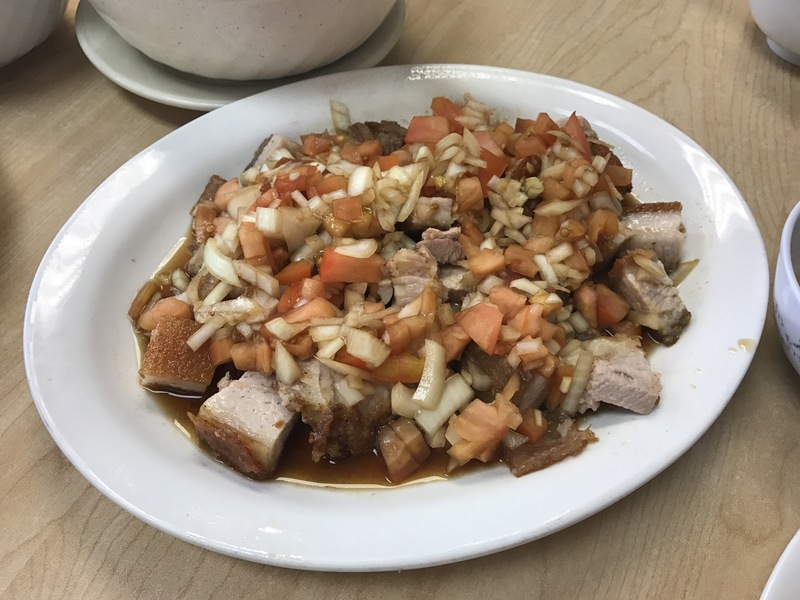 It’s lechon kawali (fried pork belly) topped with chopped onions, tomatoes, and patis (fish sauce). I know. It sounds weird. But it’s so good. Filipino food is underrated and I think it’s mostly the presentation. It never looks really amazing, but tastes so freaking good. I hope one day one of my peoples can make it more presentable. 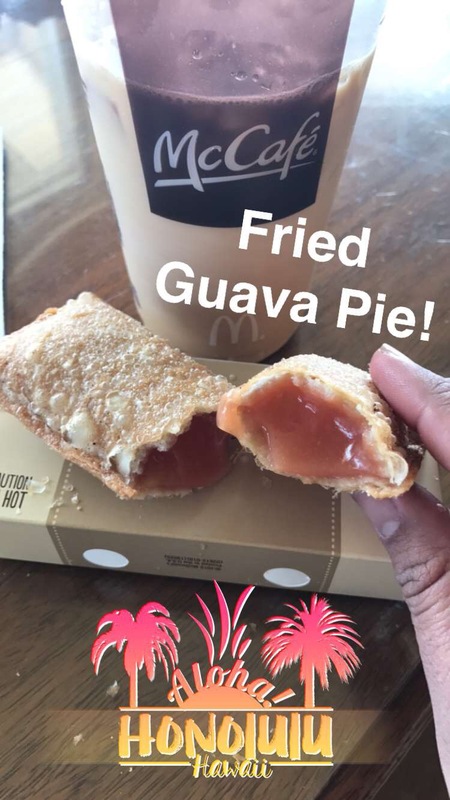 Some bonus treats, McDonald’s had a special while I was there – the Guava Pie! Basically the apple pie but with guava filling instead of apple it was so good, but it was only there for a limited time! I tried ordering it one more time before I left but they told me it was discontinued and they were bringing back the Taro Pie. 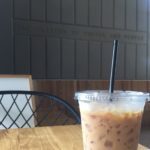 Also, another Hawai’i thing, at Starbucks you can order any drink with “Thai walls.” This basically means put condensed milk on the walls of your cup. I know it’s not exactly healthy, but I never said I went home to eat healthy! Hi! I'm Roxy, a 20-something Hawai'i girl just trying to adult in Dallas, Texas. I spend my days as an IT Project Manager and moonlight as a lifestyle blogger. Click here to get to know me better!